Come enjoy You Are My Moonshine, a beautiful 1200 sq. ft. recently renovated furnished log cabin located in a wooded setting in Hidden Mountain West. You Are My Moonshine is conveniently located close to Pigeon Forge and Gatlinburg and features 2 large bedrooms with ensuite bathrooms (one on main level and one upstairs), king size beds, 2 baths, Jacuzzi tub in master bedroom, and bunk beds in upstairs bedroom along with a sofa bed in the great room. There is a fully equipped kitchen with appliances including stove, microwave, dishwasher, and refrigerator with ice-maker, and fully stocked with pots and pans, dishware, glasses, etc. The dining area has a large table, and there is a vaulted great room with stacked stone fireplace. Other amenities include 2 flat screen TVs with DVD, cable and Wi-fi, and an in-ground outdoor charcoal grill. Three porches include a rear-screened porch with queen size swing bed, foosball table, and outdoor dining table, open side porch, and covered front porch with rockers and swing. All linens and towels are provided along with a washer and dryer, which make it easy and convenient for you. Pets are not allowed, and smoking is not allowed inside cabin. You Are My Moonshine comfortably accommodates up to 6 to 8 guests and whether it is a family or couples sharing the cabin, there is plenty of space and privacy. You Are My Moonshine is in a serene mountain setting with an easy walk to the community lake and provides you with all the modern conveniences of home, while maintaining the rustic decor and get-away you are looking for. There is easy access to the cabin from Highway 411 - Chapman Hwy. or via the Pigeon Forge Parkway. It is located just 6 miles from the parkway giving easy access to Sevierville, Pigeon Forge & Gatlinburg, where you’ll find all the activities & attractions, including Dollywood, restaurants, outlet mall shopping etc. When you're not taking advantage of all the activities in the area just sit back and relax on the large front porch or back screened porch. Enjoy the fresh mountain air, singing birds, and all kinds of wildlife around you. 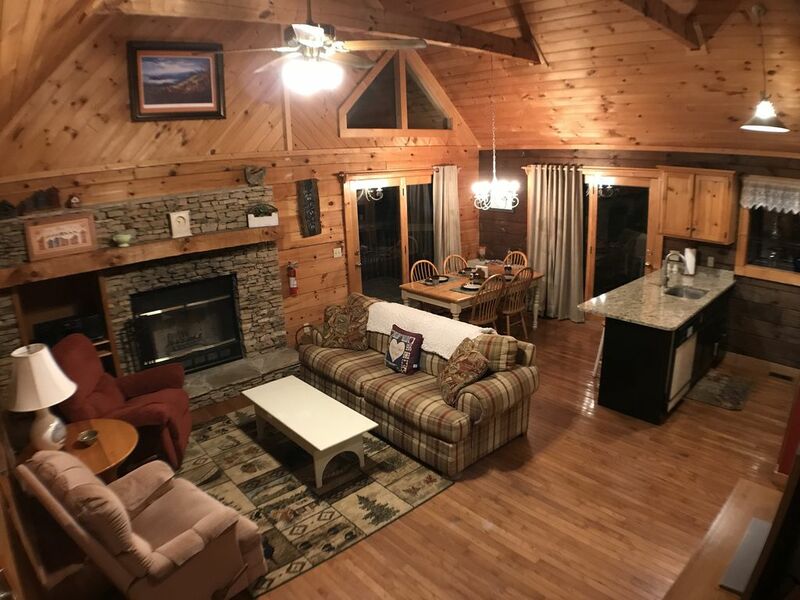 We own the cabin (Dogwood Haven - VRBO 751222) across the street and have enjoyed the area and the convenience to the national park, local attractions, and shopping. Having two cabins so close together makes it easier to provide services to the properties. My husband and I both attended the University of Tennessee, Knoxville and I grew up in the Knoxville, TN area. We both enjoy the Smoky Mountains and love the beauty of the area. Table that seats 6 along with stools at bar area. Perfect little cabin. Roads were easy to navigate. So close to pigeon forge. Definitely would stay here again. Great place! Great location...except for flooding! Cabin smelled very musty. We sprayed some febreeze to help and got it better. Other than the smell, an excellent find! Thanks for your comments Wes. I talked to housekeeping about the smell and they believe it is the fireplace. We have a Chimney Sweep coming this week to take care of it. Please come see us again. Also check out our other VRBO listed cabin, "Dogwood Haven". Very happy with our choice of You Are My Moonshine! There were so many options for cabin rentals in the Smoky Mountain area, but we feel like we made a great pick! The cabin had an overall homey feel with thoughtful, cute touches throughout. We were a family of 6 and there was sufficient space for everyone. My only minor complaint is that the entire cabin magnifies any noise so we all basically had to go to bed and get up at the same time so we wouldn’t disturb early sleepers/late risers. It rained all four days we stayed there, so I think the cabin and Cheddar’s Scratch Kitchen was the highlight of our trip! We loved. The cabin in general, it had everything you need for your stay. It was very quiet and peaceful and we would have stayed longer if the dates were available. Only a short scenic drive to pigeon forge. We could not have asked for a more perfect place to enjoy our vacation and will definitely be returning soon. nice cabin ,great weather for feb. only fault ,needs better cookware, other than that we had a wonderful time and would stay again. The cabin was wonderful. We will be back! We brought my mom for her birthday! She had a great time and really loved the cabin! Thank you for a very memorable weekend!